The first tractor show in May was so much fun, we were determined to attend a couple of more this summer. 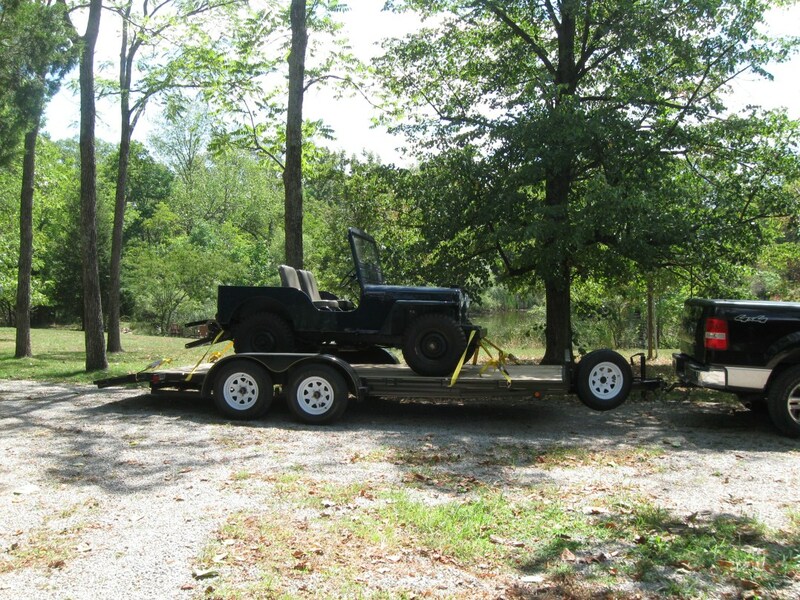 It was also a good reason to acquire a jeep hauler (18′ tandem axle car hauler) for those out of town trips. At all three shows, we were the only “farm jeep” on display, so got lots of attention and visitors. Having learned from the first show, we continued to use a combination of ads, signs and our notebook to explain the various bits of “farm jeep” equipment. It was clear from reactions at the shows we need to display the jeep with a plow on the back to really give people a clear idea of a jeep as a tractor. That means we need to get the lift working, again. Over the years we have used different pumps to power the lift, but wanted to use an authentic pump and eventually found a Newgren pump and bracket. The pump was sent to a repair shop for reconditioning and was determined to be “worn out” and not repairable. This sent us on another search for a replacement pump. One of the joys of working on old jeeps is that you get to meet interesting and extremely knowledgeable people. Our friend Lonnie knows his Newgren history and told us that the pump was the same as that used on the International Harvester model “C” tractor. After some time search for a pump, we found one on e-bay. The pump has been sitting in a box for a while and we did mount it, but did not connect it to the crankshaft before the first show. So with no other shows planned, Barry decided to hook the pump up and give it a try. 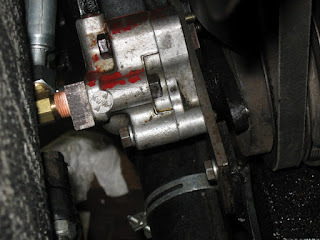 The pump is connected to the crankshaft by a solid rubber disc, which allows for some movement and alignment. The first test was a failure. Barry suspected that the pump might be running backwards (it seemed to be pressurizing the tank). He reversed the pump manifold, but the ram did not move. At this point, Barry consulted with his friends over at the Tractor by Net (TBN) hydraulic forum about possible solutions. At the suggestion of the TBN folks, we disconnected the hoses and placed them in a 5 gallon bucket half full of hydraulic fluid. The bubbles coming from the pressure side showed that the pump was working (and rotating correctly), but not primed. By pouring some fluid into the “suction hose” we were able to prime the pump and could see it working! The Newgren lift hydraulic system is pretty basic. The pump supplies pressure to a control valve located on the top of the reservoir. When the control valve is in the “hold” (neutral) position, fluid enters the control valve and “dumps” directly into the reservoir. When the lever is moved to raise the implement, the pump pressure is directed by the valve to the top of the ram, pushing the ram rod out and raising the implement arms up. When the control valve is in the “lower” position, fluid in the ram is returned to the reservoir and the ram rod is pushed in by the weight of the implement. Since we know the pump is working, we could reconnect the hoses (pressure side to the control valve and return side to the bottom of the reservoir). After adding fluid to the reservoir and working the control valve a few times, the arms moved up. Success! Sort of. Any pressure on the arms would stop the upward movement. 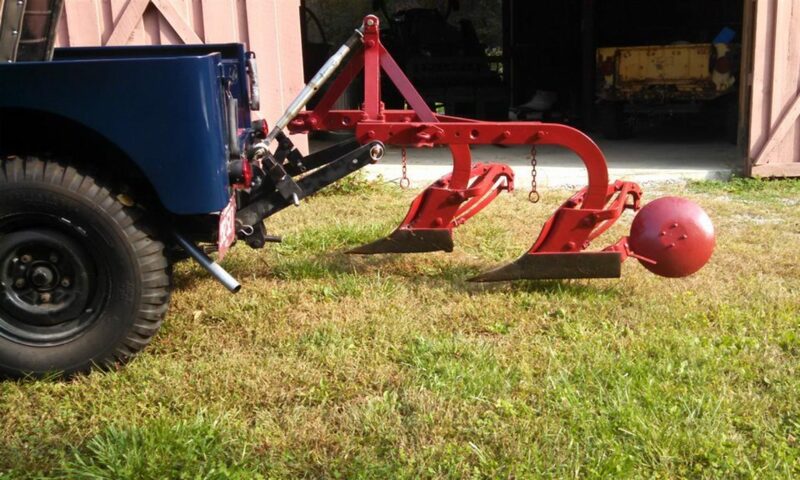 No way this is going to lift a 200 pound plow. We may still have a problem if the pump isn’t providing high enough pressure. Or the control valve, although we have taken it apart and cleaned it, may not be working correctly. And we have leaks in the system. Unfortunately, those leaks appear to be coming from the top of the reservoir, which means lowering (un-installing) the entire lift. We have had the lift in and out of two jeeps on several occasions. While not a terribly difficult task, it is a hard balancing act, not unlike removing a transmission. So before we attack the leak, we are going to try and build something along the lines of a transmission jack to help us get the job done. this is a wonderful combination of power and style.The size of the tires and design makes it even more Jeep related and good, showing great performance.